April 11, 2007. Ron Noe was one of the first Dolphin owners we talked to about this website. 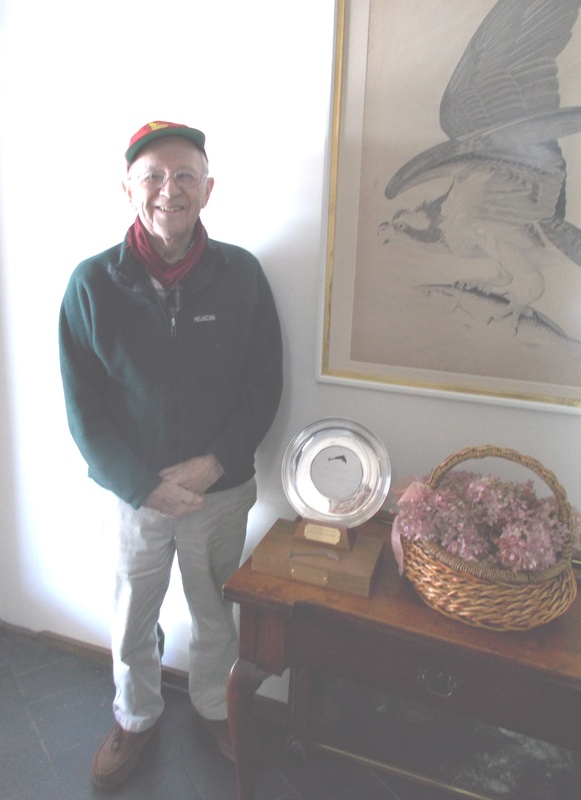 He bought his Lunn built boat from Hugo Hilderdorf of Patchogue, Long Island, New York, who was the first owner. 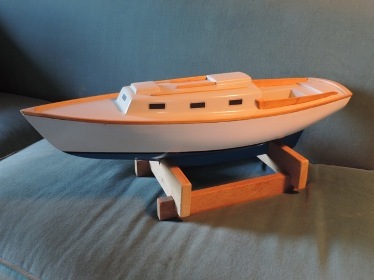 It was one of the first 3 Lunn's, a stripped out, empty boat that Ron built out to have her go as fast as a Dolphin could go. According to Clark DuBois (Peridot, Marscot/O'Day #14), Ron has the last Dolphin 24 National Championship Trophy - we need to find out more about this! November 13, 2013. Over the past several months we have been developing a story of the connection between International 14's, one of the very early racing dinghies, and the Dolphin 24. Essex Yacht Club was a hotbed of its racing activity. You can read all about this by clicking here. 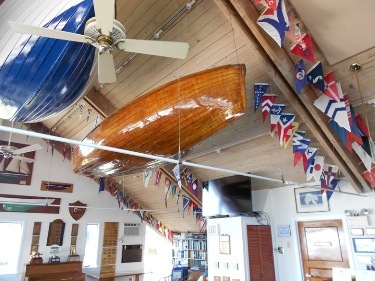 Hanging from the ceiling of the Essex Yacht Club in its trophy/bar room is this International 14 donated to the club by Ron Noe. Picture taken by Dolphin 24 website staff. 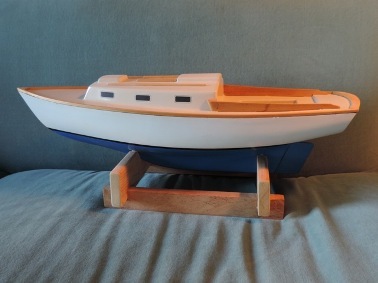 The fiberglass hull and deck parts were made by Roy Berg and given to me along with teak trip pieces sufficient to do the work. It took me forever to complete the model thanks to a collection of reasons but when Roy and I talked recently, about 7 years ago, he asked if I had finished the model. December 14, 2013. 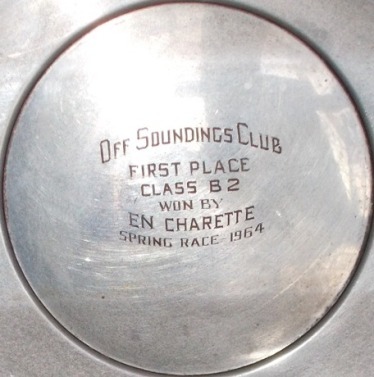 On a review of the Off Soundings Club archived regatta results at the Mystic Seaport Museum's Blunt Library, we found that Encharette was 1st overall in the 1964 Off Sounding Club's Spring Series - 46 boats were entered. Click here to go to a page that lists some of the Dolphin 24 racing success in the Off Soundings Club. February 13, 2018. We have been remiss in not updating this page with Ron's contribution to our 2017 Dolphin 24 New England Championships. Click here to go there. Ron donated his 1964 Spring Series Off Soundings Club Trophy to be 're-cast' as the NE Championships trophy. 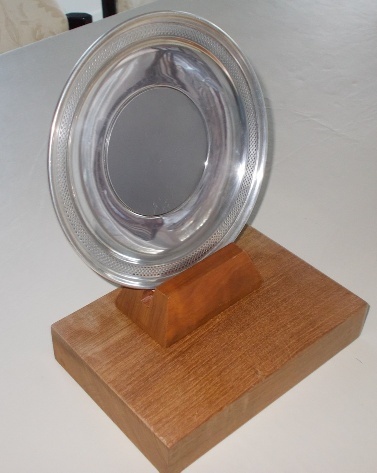 Encharette won the 1964 Off Soundings Club Spring Series - total entries 52 - and Ron was awarded the trophy below. 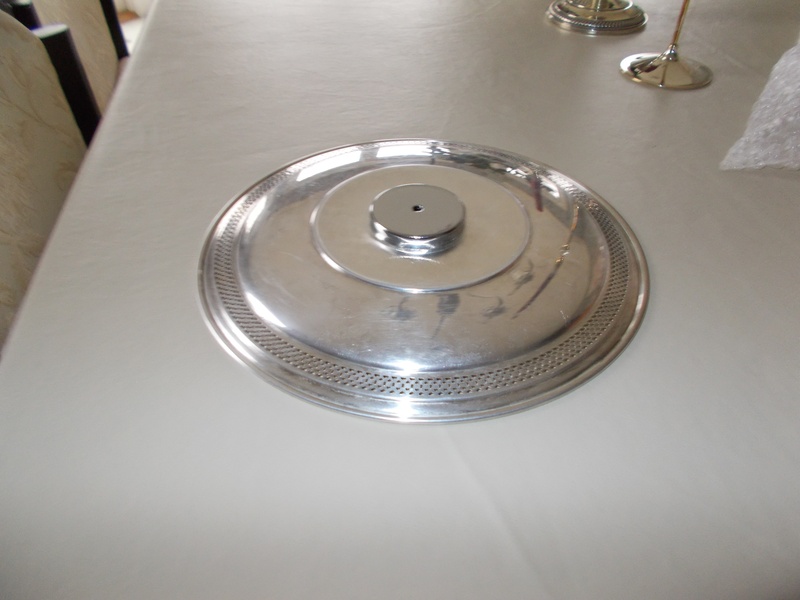 It's a Sterling Silver dish with a perforated edge (left). 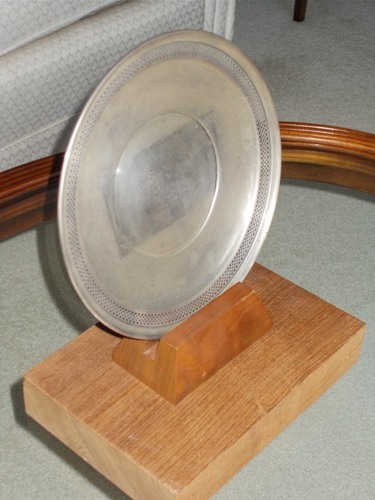 We will mount it on teak blocks with new gold/brass, black lettering engraving plates, and a new center section disc for the new engraving. 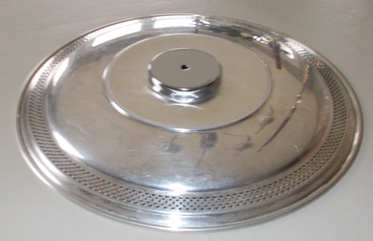 The magnet, below. On the right is the trophy on it's partially cleaned up blocks, freshly polished with new center plate in place, not yet engraved, and gold/brass plates not yet done. 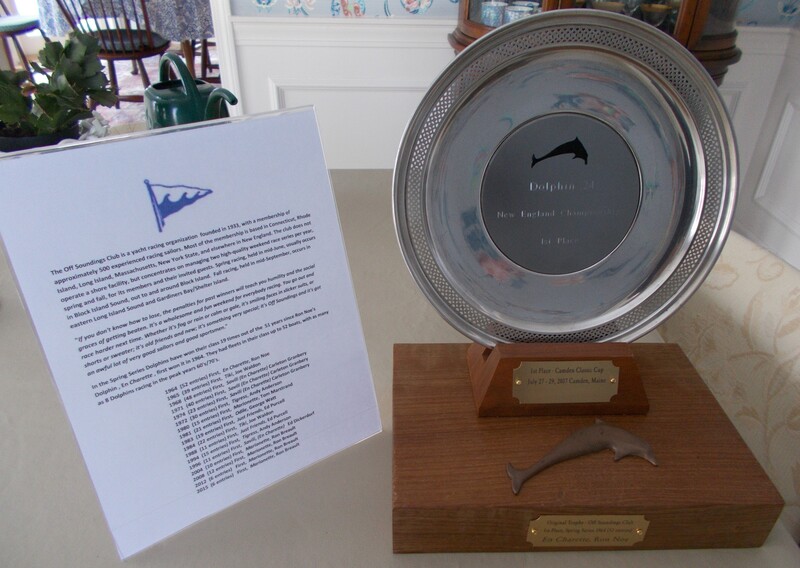 In the 53 years since Ron Noe won this Off Soundings Club series Dolphin 24's have won it 19 times! In the 1960s and 70s there have been as many as 8 Dolphin 24 entered in a given series. A summary of Dolphin 24 winners will be in a separate 'exhibit' on display in Camden - a mock up of which you can see by clicking here.